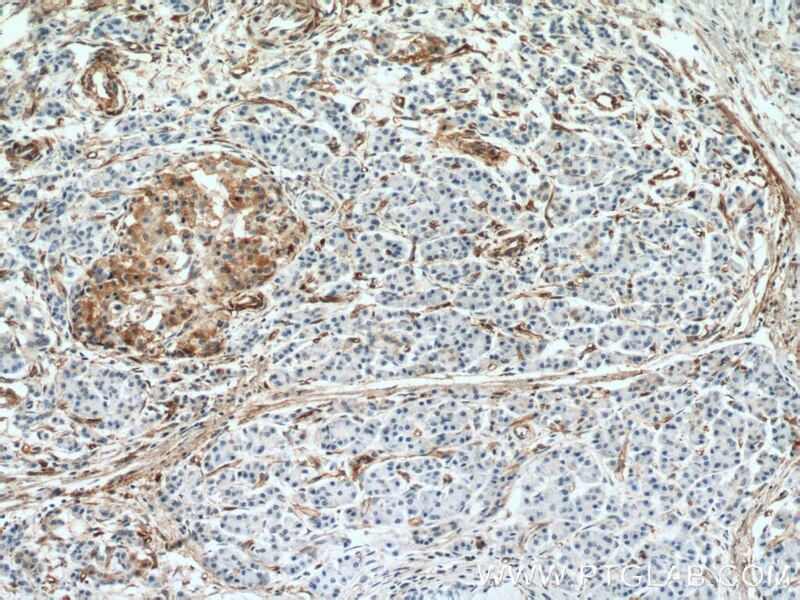 Immunohistochemical analysis of paraffin-embedded human pancreas cancer tissue slide using 66433-1-Ig (Amphiregulin antibody) at dilution of 1:300 (under 10x lens) heat mediated antigen retrieved with Tris-EDTA buffer(pH9). 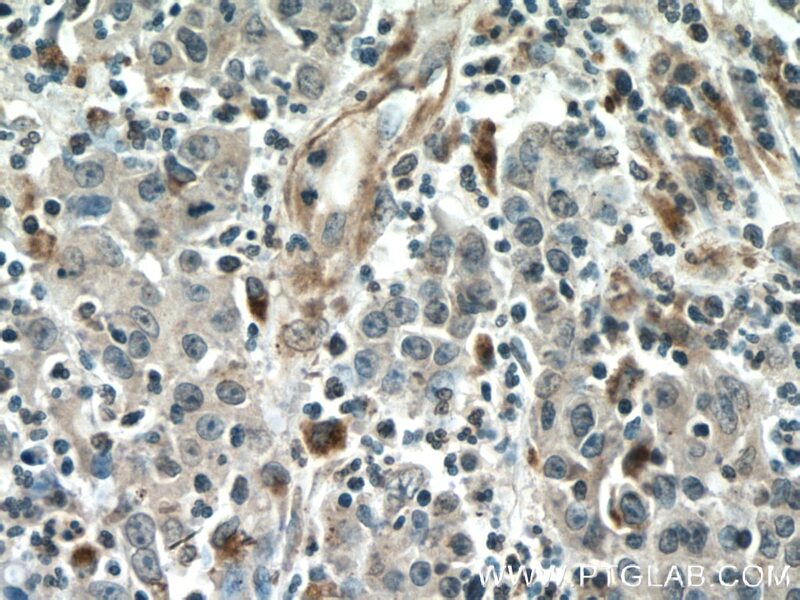 Immunohistochemical analysis of paraffin-embedded human pancreas cancer tissue slide using 66433-1-Ig (Amphiregulin antibody) at dilution of 1:300 (under 40x lens) heat mediated antigen retrieved with Tris-EDTA buffer(pH9). Amphiregulin (AREG) is one of the ligands of the epidermal growth factor receptor (EGFR). AREG plays a central role in mammary gland development and branching morphogenesis in organs and is expressed both in physiological and in cancerous tissues. The AREG protein is synthesized as a 252-amino acid transmembrane precursor, pro-AREG. At the plasma membrane, pro-AREG is subjected to sequential proteolytic cleavages within its ectodomain and is then released as the soluble AREG protein. Depending on the cell type and microenvironment, AREG can be produced in multiple cellular and mature forms using alternative pro-AREG cleavage sites and glycosylation motifs. Post-translastional modfications of 50-kDa pro-AREG produces a major soluble 43-kDa form, 28-, 26-, 16-kDa membrane anchored forms, and soluble 21-, 19-, and 9-kDa forms (PMID: 9642297). CD9 regulates keratinocyte migration by negatively modulating the sheddase activity of ADAM17. 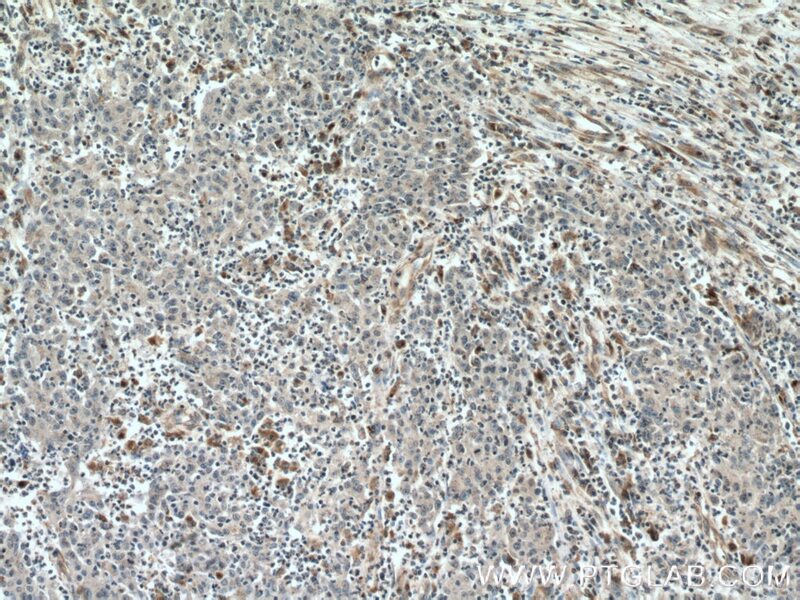 Immunohistochemical analysis of paraffin-embedded human colon cancer tissue slide using 66433-1-Ig (Amphiregulin antibody) at dilution of 1:300 (under 10x lens) heat mediated antigen retrieved with Tris-EDTA buffer(pH9). 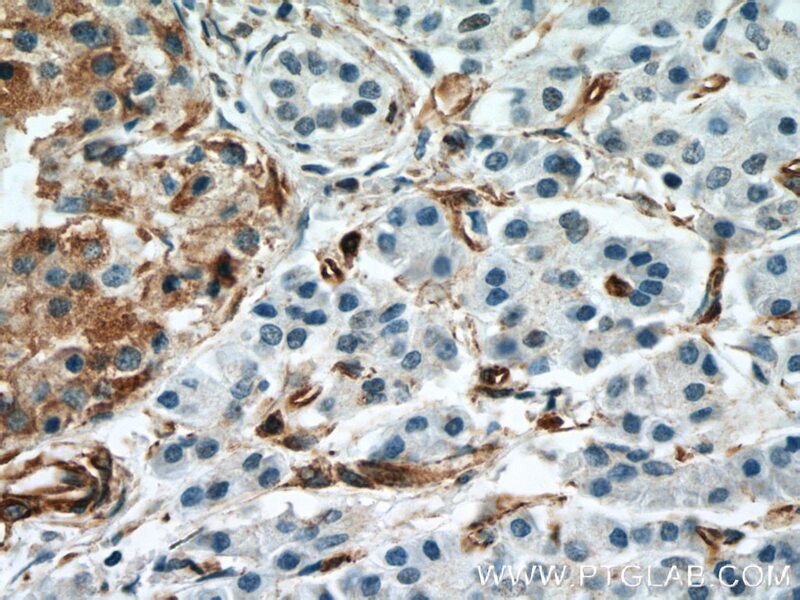 Immunohistochemical analysis of paraffin-embedded human colon cancer tissue slide using 66433-1-Ig (Amphiregulin antibody) at dilution of 1:300 (under 40x lens) heat mediated antigen retrieved with Tris-EDTA buffer(pH9).